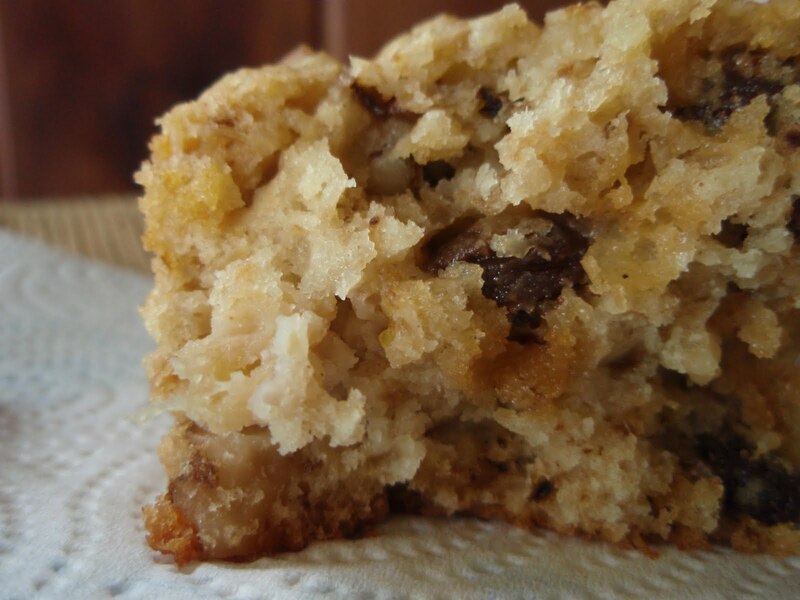 A Southern Grace: oats and raisins and walnuts, oh my! What do you make when you have a tub of oats, a massive jar of applesauce, and oodles of raisins on hand? Some might say that cookies are the obvious choice, but being the lazy gal that I am, my vote goes to quick bread*! The results of this recipe are fluffy yet dense and even a little bit chewy, which is quite a unique quality for this type of bread. Would cookies be better? Perhaps. Perhaps not. *Are you sick of seeing these gazillions of quick bread recipes yet? Sorry. The mini loaf has become a staple in our household--they make great "handfood," which means they're easy to grab and eat on the run. I doubt the various versions of the convenient little rectangles will disappear any time soon, so if you're sick of 'em, tough. I does what I likes and I likes what I do. Preheat the oven to 375 degrees F. Line a muffin pan with paper liners or grease a different but equivalent-in-portion pan. In a large mixing bowl, combine the flour, oats, baking powder, baking soda, salt, and nutmeg. In another bowl combine the applesauce, buttermilk, sugar, oil, vanilla, and egg. Make a well in the dry ingredients and add in the applesauce mixture. Stir together just until all dry ingredients are incorporated. Gently fold in the walnuts and raisins with a spatula. Divide the batter evenly among the prepared molds. Bake for 16-18 minutes for muffins, around 30 minutes for mini loaves, or until a toothpick inserted in the center comes out clean. Cool on a wire rack. What a wonderful texture! That is a delightful bread! I could never be sick of your quickbreads! You always have the best flavor combos. Like this one. Awesome. Does anyone get tired of quick breads? I hope not, 'cause I make a lot of them! And this one will go on my list ASAP...applesauce? buttermilk? Yum. Makes this bread so moist! Sick of quick bread? Never! We love it, and any extra goes to the freezer or the table of a grateful friend. I think I'll forsake my standard banana bread recipe to try your beautiful, more healthful version. Thanks, as always, for sharing with us. You should consider to publish your own "coffee cake" book! Love this type of cakes, rich, moist and 'pick-up-your-mood'! we need to get you your own bread truck. all these fabulous creations on one truck--yeah you'd make a ton of cash sister. I've finally gotten myself some mini loaf pans and need to start using them more! Applesauce, oats, walnuts, and raisins--sounds like a healthy and delicious quick bread. Having good handfood on hand is the best. Buttermilk, applesacue, plump, juicy raisns...I don't see how it could get any better except to add the oats. I come for the profound and abstruse narrative (even though I don't know what abstruse means) AND for the delicious quick breads. I'm okay for quick bread except when you add in raisins. EW! Great recipe for an easier cake on the go. Not sick of the quick breads, grace! This sounds wonderful, and who doesn't like convenience, speed, and yumminess?! What you make with that tub of oats is something good for you that doesn't taste like cardboard! Excellent choice! You crack me up! Of course we are not sick your quick bread! Mini loaves are the way to go in our house too. Only two of us. 3 of my absolute fav ingredients! I had a bad experience with applesauce. Tried to make healthy muffins by substituting butter with applesauce and they turned out rock hard and nothing like this! P.S. I'm not getting sick of these quick bread recipes. Keep them coming! They all look delicious. Wow... this looks so good. That s "A lick the screen" photo! I'm all for handfood, narratives (profound or not) and quick breads. I never get sick of quick breads or muffins!! These do look like such tasty little cakes. I'm always wanting more quick bread recipes. these are just perfect. You had me at oats and raisins! a winning combination if ever I'd eaten one! This is going into my cakes for autumn folder! I'm making your sour cream cake for my husband's birthday today - it is his very favourite cake! Des muffins qui semblent délicieux. Gread sounding quick bread! Have a wonderful 4th of July Grace. Handfood. That's cute. I'm stealing it! With applesauce and buttermilk in the batter, I bet this is one lusciously moist cake that keeps well, too. there is no such thing as too much quick breads. 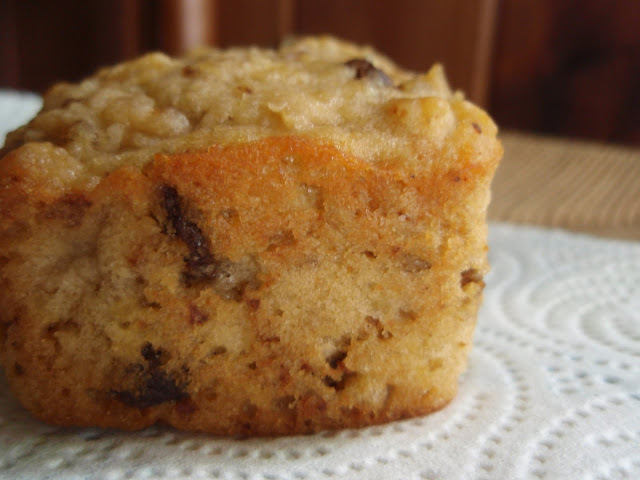 I love that you made these into muffins and I love the applesauce, nuts, and raisins! I wish I had one of these for breakfast this morning! I never tire of quick breads. I think they are oh so easy too- they always come in handy. I don't think it's possible to tire of quick breads...mmmm yummy! Always on the lookout for interesting things to bake with oats. This one looks yummy! Just a perfect recipe and wonderful photo. Oatmeal and raisin cookies are one of my favourites, and I do always have buttermilk and applesauce left over in my fridge; this sounds pretty perfect to me!